Federal Judge William H. Pryor Jr. of the U. S. Court of Appeals 11th Circuit told graduates of Samford University’s Cumberland School of Law that commencement for a law school is more than a celebration of the success of its students and faculty. 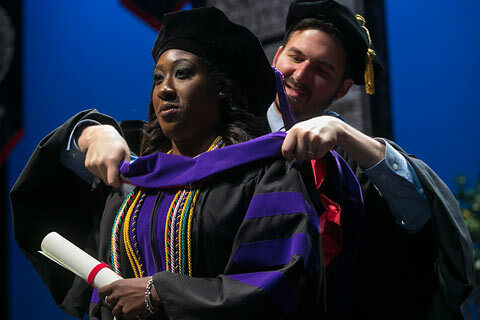 Law school commencement celebrates “the American commitment to the rule of law, which is the bulwark of our freedom,” said Judge Pryor. He quoted Thomas Paine as saying that “in absolute governments the King is law,” but “in America the law is king.” Cumberland School of Law has celebrated that fact since 1847, Pryor added. Pryor, who also serves as acting chair of the U.S. Sentencing Commission, spoke May 12 to a law graduation audience of about 1,500 in Samford’s Wright Center. The class comprised 130 candidates for the Juris Doctor degree and three candidates for the Master of Comparative Law. Cumberland School of Law also presented its annual Daniel Austin Brewer Professionalism Award to graduates Kevin W. Bufford and Jonathan A. Griffith. Lawyers “must defend the innocent and prosecute the guilty, and champion the rights of all, poor and rich alike,” he said. Regarding service, Pryor suggested that the young lawyers should consider running for elected office or seeking an appointed office, that they consider a career as a prosecutor or public defender, and perform pro bono work.